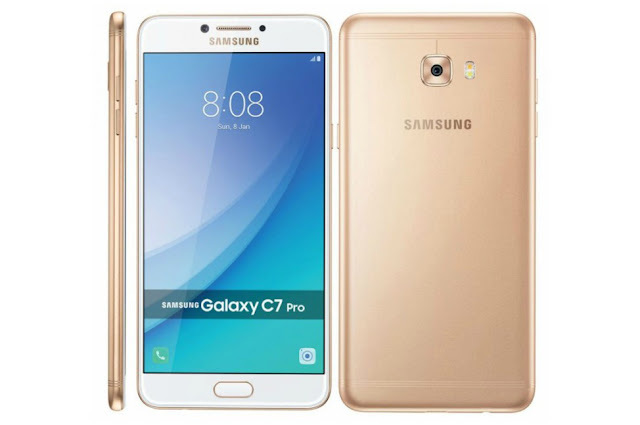 Samsung India launches Galaxy C7 Pro for Rs. 27,990 - AndroGuider | One Stop For The Techy You! Samsung is expanding its Galaxy C line up in India with the launch of Galaxy C7 Pro. It is priced at Rs. 27,990 and will be exclusively available starting April 11 on Amazon India in Navy and Gold hues. The Galaxy C7 Pro is Samsung's second Galaxy C series offering to the Indian market, the other one being Galaxy C9 Pro, which was the company's first smartphone to pack 6GB RAM. Like Galaxy C9 Pro, the new Galaxy C7 Pro sports a premium all-metal unibody design with three thin antenna lines at the top and bottom of the back panel. It also includes a fingerprint sensor, which is integrated into the home button. Coming to the specs, the Galaxy C7 Pro features 5.7-inch Full HD Super AMOLED display, octa-core Snapdragon 626 processor, 4GB RAM and 64GB storage, which can be further increased via microSD card. It gets 16MP f/1.9 rear camera with LED flash and 1080p video recording and 16MP front facing camera. Running Android Marshmallow, the phone is backed by 3300mAh battery and supports 4G LTE, WiFi 802.11ac, Bluetooth 4.2, NFC, GPS and USB Type-C for connectivity. It also comes with Samsung Pay mobile payment solution.